New York, NY - He has sung at the United Nations, the Knesset and the Capitol Rotunda, but for the Israeli-born cantor who sang at Friday’s interfaith memorial service which included representatives of religious leaders of numerous faiths was an emotionally charged experience. Cantor Azi Schwartz, who serves as the chazan at the Park Avenue Synagogue, was called upon to make a Kel Maley Rachamim during the poignant memorial service at Ground Zero. Schwartz’s four minute prayer for the fallen, which was translated by a sign language interpreter, was followed by another prayer, this one for peace throughout the world. The Park Avenue Synagogue shares a warm relationship with Cardinal Timothy Dolan, who paid a personal visit to the synagogue last November as a show of support after the Har Nof massacre. Schwartz described the interfaith memorial service as a well organized and orchestrated production and said that both he and the synagogue’s rabbi, Rabbi Elliot Cosgrove, spoke at length with the bishop who coordinated the service about what prayer would be most appropriate for the occasion. “Eventually they selected a memorial prayer plus a prayer for peace, Oseh Shalom,” said Schwartz. 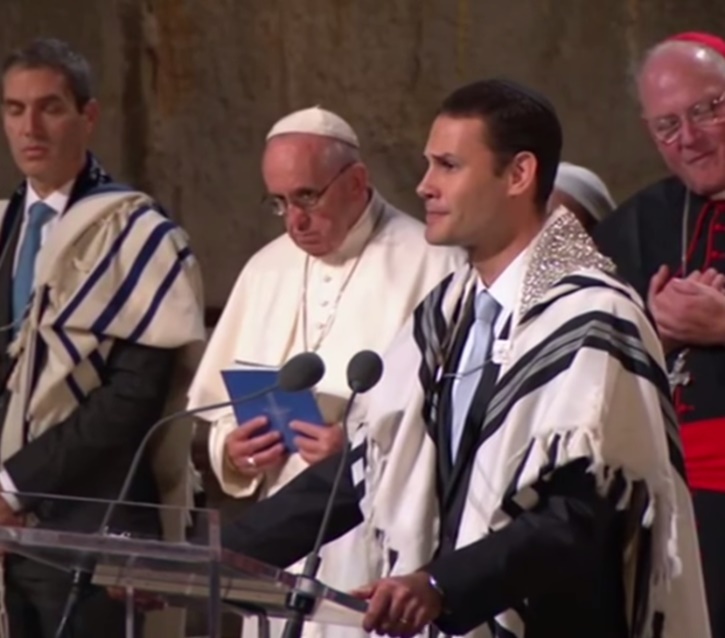 Watch below Cantor Schwartz at 9/11 Memorial Service With Pope Francis. Schwartz, who grew up in Alon Shevut, is a graduate of Yeshivat Har Etzion. He served as a soloist in the Israeli Defense Forces Rabbinical Troupe and studied music at the Mannes School of Music in New York, the Tel Aviv Cantorial Institute and the Jerusalem Rubin Academy of Music and Dance. The 34 year old father of three has worked as the chazan in the Palm Beach Synagogue and the Park East Synagogue and as the assistant cantor at the Great Synagogue in Jerusalem. The gift of music clearly runs in the family: Schwartz is the son of a musicologist and the grandson of a chazan. Singing as a cantor at the widely watched memorial service, and representing the Jewish community, was a moving experience for Schwartz. As the grandson of four Holocaust survivors, Schwartz observed that being able to publicly perform as a cantor always stirs up a wide array of feelings. The opportunity to take part in the interfaith service brought with it many memorable moments. 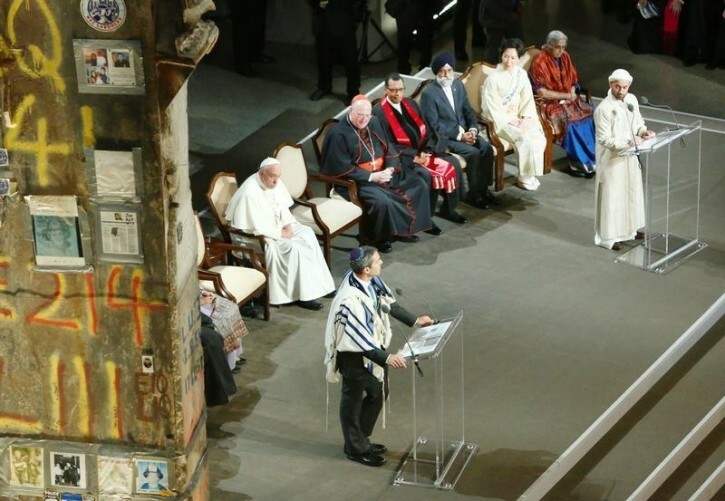 Schwartz credited the pope for serving as the catalyst for an opportunity to foster greater unity between religious leaders and shared his thoughts on his brief exchange with Pope Francis. Fa. You should not be near this Tumai. My thoughts exactly but of course they rationalize that in the spirit of peace with the nations, we must play along. Yuck. Did you guys ever hear of כי ביתי בית תפילה לכל העמים? The whole world belongs to HKB"H, and the entire universe is His house. Anyone may speak to Him anywhere anytime. What grinds my gears is that the "rabbi" at these events always wears a tallis. They have to wear their costume so everyone can see they are the "observant" Jew on the platform. The cardinal in the back was enjoying the performance as they learn classical Hebrew and Aramaic in seminaries too. There is a photo of the clerical heads in warsaw of the 1920s with the chief rabbi standing with the non jewish clergy. I assume if non jews would say how could I look at a big godols face fa a unclean person would would have no issues. As far as the tallis the chazan said some prayers so it wore tallis what is the big deal. He was not jsut giving a speech.